They've barely begun to understand each other when Raphael receives an invitation to a ball from the archangel, Lijuan. To refuse would be a sign of fatal weakness, so Raphael must ready Elena for the flight to Beijing—and to the nightmare that awaits them there. Ancient and without conscience, Lijuan holds a power that lies with the dead. And she has organized the most perfect and most vicious of welcomes for Elena. It has taken me awhile to become engaged with this series, I am not a big vampire paranormal fan. Listening to the first one in the series was probably a mistake - though it was well narrated. I find for a book from a series like the Guild Hunters it is better read in the hand! 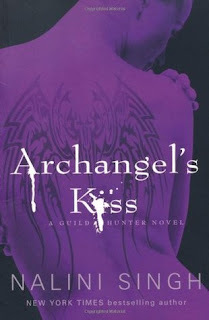 Archangel's Kiss explored more deeply the relationship of Elena and Raphael. Raphael tends to be a little arrogant, but his saving grace is that he loves Elena. Many of the angels and vampires see Elena as Raphael's 'pet'. She has much work to disabuse them of this idea. Indeed even Raphael needs to know that what Elena is looking for is a mutual relationship - not a master/slave one. Elena is often dismayed by the ruthlessness in Raphael, when it comes to justice, however on many occasions she has to accept it is what is needed. In Archangel's Kiss we learn a little more about Elena's past. We learn of the horrible experience she has had as a child, how she has become estranged from her father. She carries much guilt and her nightmares push more and more into her every day life. Part of her healing I am sure is going to come as she shares her story with Raphael. He on one hand struggles with his ability wherein he could with a flick wipe all her traumatic memories. However they are part of what makes Elena, so can he restrain himself? Raphael himself has a troubled childhood, which he shares a little of, with Elena. The seven are those that guard Raphael. Dmitri, Venom and Naasir are all vampires, Galen, Ilium, Jason and Aodhan are angels. They are willing to protect Raphael with their lives and often are badly wounded doing it. Each of them has a back story which we slowly are being given. As Elena has been weakened by her year of sleep during the change, she is always closely guarded by one and sometimes two of these males if Raphael is absent. Galen and Dmitri help Elena hone her combat skills as her newly awakened body becomes accustomized to her wings. Always there is tension between Elena and these protectors, however they do their jobs well, and I predict will form strong bonds with her as the series develops. Will I read the remainder of this series? Of course - I am hooked!